Elite Stat: Ben Roethlisberger had an adjusted completion percentage of 82.2 percent this week. Antonio Brown was the star on Sunday night football, but the man throwing him the football was pretty impressive himself, and even better than his box score numbers looked thanks to his receivers dropping four passes, more than one of which were very good throws. Roethlisberger had a passer rating of over 100 when pressured and hit on three of the four deep passes he attempted. At the death, while Brown’s catch was a staggering play to keep the Steelers alive, Roethlisberger’s pass was pretty impressive to get over coverage and give him a chance. Elite Stat: Joe Mixon broke five tackles and gained 3.1 yards per carry after contact against the Browns. Before the season Joe Mixon was a lot of people’s favorite for rookie of the year honors, but things have been tough going for the most part. This week against Cleveland, though, he got things on track in a major way, racking up 114 rushing yards, 71 of which came after contact. He added another 51 yards as a receiver, catching all three of the passes thrown his way. Elite Stat: Julio Jones gained an absurd 7.67 yards per route run this week. Julio Jones had one of those games where he was just completely unstoppable. He caught a deep touchdown on a pass thrown by fellow receiver Mohamed Sanu and also brought in a sideline grab that he was able to turn up field on a play that ended with him diving towards the pylon for a score. Jones caught a dozen passes from 15 targets, putting up 253 receiving yards and a perfect wide receiver rating of 158.3. Elite Stat: Keenan Allen gained 5.38 yards per route run this week. Retaining his spot on the team of the week, Keenan Allen managed to split the spectacular duo of Julio Jones and Antonio Brown when it came to PFF grade this week. Back on Thanksgiving, Allen caught 11 of the 14 passes thrown his way to amass 172 receiving yards and a touchdown. He beat five different Dallas defenders for receptions and four for 25 or more yards. Elite Stat: Zach Ertz gained 2.78 yards per route run this week. The Eagles once again rolled over their opposition, and this time Zach Ertz was by far the biggest receiving threat on the team. He led the team with 12 targets, ten receptions and 103 receiving yards, getting himself on the score board in the process. He beat seven different Chicago defenders for receptions, and saw targets against another two over the course of the game. Elite Stat: Antonio Brown gained 3.45 yards per route run this week. Antonio Brown was simply uncoverable on Sunday night against the Packers. From the first pass of the game hitting him in stride on what seemed like too easy a pitch and catch to one of the last plays of the game that featured one of the best sideline catches of the season, Brown was simply magnificent. He caught ten of the 12 passes thrown his way including the most critical catch of the game to keep the Steelers alive in the final seconds. Elite Stat: Nate Solder allowed two total pressures this week. Nate Solder has had an up and down season with the Patriots coming off a Super Bowl in which he was a disaster overall, but he has now strung together three straight impressive performances and this week was the best game of his season. Against Miami, he allowed just two hurries but was dominant as a blocker, particularly at the second level where he was consistently getting onto LB Stephone Anthony and taking him out of the play. Elite Stat: Clint Boling allowed no pressures across 31 pass-blocking snaps. Clint Boling had an excellent performance for the Bengals in the battle of Ohio this past week. He didn’t allow a pressure of any kind across his pass-blocking snaps, nor did he surrender a penalty. He was also impressive as a run blocker, paving the way for RB Joe Mixon’s big day. The Bengals averaged 4.3 yards per carry on runs immediately either side of Boling’s blocks, with just 1.8 of those coming after contact. Elite Stat: Alex Mack allowed no pressures from 35 pass-blocking snaps. Going up against the Tampa Bay defensive front was an interesting challenge for the Falcons this week, and almost all of their blockers rose to the challenge. Alex Mack was back to his best, allowing no pressures as a pass protector, and once again anchoring their zone blocking run scheme in the middle of the line. Mack was impressive against Chris Baker in the middle of the line, defeating the bigger man with quickness and technique time after time. Elite Stat: David DeCastro allowed two total pressures from 49 pass-blocking snaps. David DeCastro has been having a career year this season and has looked like the best guard in football for most of the year. He was a crushing run blocker against the Packers, even when he drew the task of going up against Packers standout lineman, Mike Daniels. DeCastro only allowed two total pressures, but was consistently destructive as a run blocker, overpowering linemen and linebackers alike. Elite Stat: Ryan Ramczyk allowed one total pressure this week. A player who deserves serious rookie of the year recognition, Ryan Ramczyk had another strong game going up against the Los Angeles Rams this past week despite his team coming out on the losing end. Ramczyk allowed just one hurry across 41 pass-blocking snaps, many of which being obvious passing situations, but also run blocked well and didn’t commit a penalty in the game. Elite Stat: Kawann Short had five total pressures this week. Kawann Short tore the interior of the New York Jets offensive line to pieces this week, even if he failed to generate a sack. He did have a hit and four hurries, while making a pair of defensive stops. What was impressive was not so much the volume of pressure, but the speed and decisiveness with which Short won when he did get pressure. Short was too fast and destructive for either G James Carpenter or C Wesley Johnson to block. Elite Stat: Jurrell Casey had seven total pressures against the Colts. 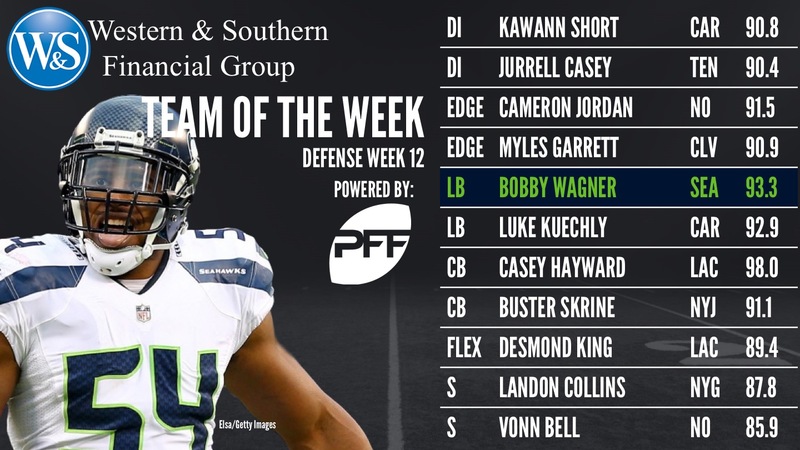 For the first time in a while, Aaron Donald does not feature on PFF’s team of the week. This week we got a dominant performance from Tennessee’s Jurrell Casey, featuring a sack, a hit and five hurries as a pass-rusher. Casey got the benefit of attacking a weak Colts offensive line and he put together one of the strongest games of his season and is now on track for the best year of his career. Elite Stat: Cameron Jordan had six total pressures from 47 pass rushing snaps. We have come to expect Cameron Jordan to be really impressive for the Saints, but that always becomes more notable when he does it against top competition. Jordan handed Andrew Whitworth by far the biggest loss of his Rams career this season, and the first real poor day he has had for the team. Jordan had a pair of sacks, a pair of batted passes, four hurries and four defensive stops overall in the game. It was one of the best statistical performances of the week at any position. Elite Stat: Myles Garrett had three total pressures against the Bengals. 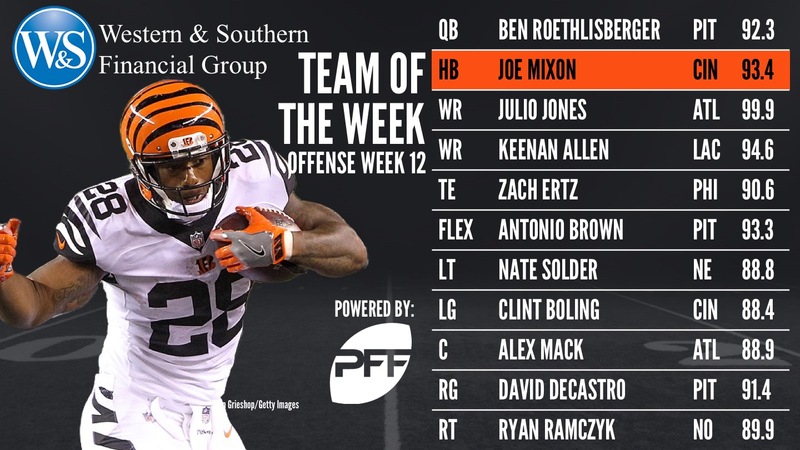 The first of what the Browns hope and expect will be many appearances from Myles Garrett on PFF’s team of the week, Myles Garrett was once again excellent this week in the battle of Ohio. Though the Browns defense was generally poor and fared worse than their baseline this season, Garrett was dominant, notching a sack, two hits and turned in four more plays in which he beat his man but the ball was gone before he could turn it into pressure on the quarterback. Elite Stat: Bobby Wagner allowed just 11 yards in coverage against the 49ers. Bobby Wagner has been the best defensive player in the game through 12 weeks of the season, and was once again excellent this past week against the 49ers. Wagner has been a force in coverage, and picked off a pass in this game while allowing just 11 yards from six targets. He also had three total pressures from as many pass-rushing snaps on the blitz. Elite Stat: Luke Kuechly allowed just 12 yards in coverage against the Jets. Luke Kuechly continued his fine run of form against the Jets, grading extremely well against both the run and the pass as he showcased his skills as one of the game’s best and most complete linebackers. Kuechly allowed just one catch for 12 yards in coverage, while breaking up one of the incompletions, but he was also impressive in the run game, regularly coming down hill to stuff the run. Elite Stat: Casey Hayward allowed a passer rating of just 11.3 when targeted this past week. Casey Hayward retains his spot on the PFF team of the week and is making a strong case to be seen as the best cornerback in the game this season. His performance against the Dallas Cowboys back on Thanksgiving was amazingly thorough, and he allowed just 22 yards despite being thrown at seven times. Hayward picked off one of those targets and broke up another two. Elite Stat: Buster Skrine allowed just two catches for 27 yards against the Jets. Not a player you typically expect to find on the team of the week, Buster Skrine nonetheless had an excellent game against the Panthers this week. Skrine was thrown at six times, but allowed just two receptions for 27 yards, while breaking up three of the incompletions, two on passes intended for Devin Funchess and one when targeting Greg Olsen. Elite Stat: Landon Collins run-stop percentage of 14.3. Landon Collins retains his spot on the team of the week with another strong performance back on Thanksgiving against the Washington defense. Collins was a constant problem in the run game, firing down hill and chasing run plays down from the back side, killing them for short gains because he was timing the snap so well. He led the team both in solo tackles (11) and defensive stops (five). Elite Stat: Vonn Bell had a run-stop percentage of 11.1. The Saints defense had its problems against the Rams, but they had some impressive individual performers, of which Vonn Bell was one. Bell had seven solo tackles and three defensive stops in the game, as well as a sack of Jared Goff. Bell also made a nice play on special teams as a kick off coverage player. Elite Stat: Desmond King was targeted once every 4.8 snaps in coverage. Picking a pass off and returning it for a touchdown (like he predicted) to put the finishing touches on their big Thanksgiving win was just the highlight of King’s performance against Dallas this past week. King was thrown at five times, four before his pick-six, but he also played extremely well on special teams, notching a pair of tackles on kick returns. Could it really be anyone else this week? Dawson’s leg has somehow gotten stronger with age, and he nailed a 57-yard, game-winning field goal for the Cardinals against the Jaguars. Morstead is having a phenomenal season for the Saints, and it continued with a big performance in the loss to the Los Angeles Rams. Four of his seven punts landed inside the Rams 20 yard line, helping Morstead to rise to third in our season punter rankings. Given that this is not the first time he has found the end zone in the NFL on a kick or punt return, it’s surprising that Clay hasn’t stuck around on a roster yet, but with another key return for the Panthers this week, his chances of sticking in Carolina should be much higher. A 2016 undrafted free agent, Wilson has been solid on special teams over the past two seasons and delivered the best game of his career on Sunday. He registered two tackles, and was key on both the punt and kickoff teams.